← Ontario, Canada. September 9th, 2013. English Avenue was scheduled to be closed until 2 a.m. Tuesday after a water main break opened a sinkhole. 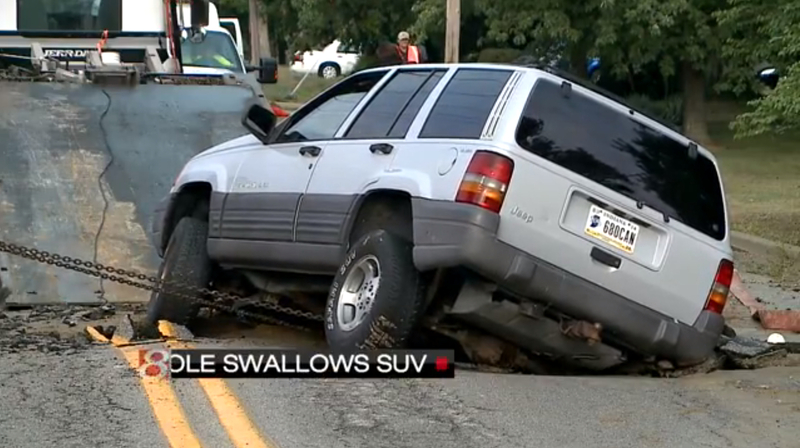 The driver of a Jeep was taken to the hospital after the car he was driving in was swallowed by the sinkhole on the city’s southeast side Monday morning. IMPD closed English Avenue at Woods Crossing Drive, just east of English Avenue and Shortridge Road, which was the site of the sinkhole. Police on the scene said a water main broke and caused water to flood the road. The driver was driving an older model Jeep Cherokee when the road gave way. The SUV landed inside the sinkhole. It was approximately 3 to 5 feet wide and 4 feet deep. Police were called to the scene just after 8 a.m. The male driver, who is in his 20s, was at a local hospital for neck and back pain. 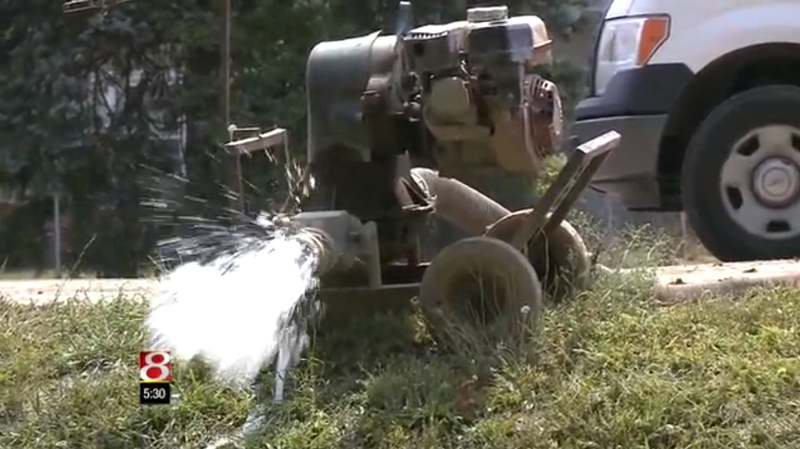 Citizens Energy officials said water crews would need to fix the break, which was due to “aging infrastructure.” Because of the main break, 65 homes were without water. Although Citizens initially thought crews would need six or eight hours to get the work done, officials said at 2 p.m. that English would need to be closed 12 hours. Police asked driver’s to avoid the area. This entry was posted in Pictures, Vehicle v Sinkhole and tagged Indiana, Indianapolis, sinkhole. Bookmark the permalink.